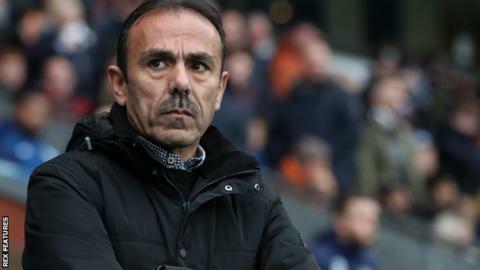 Championship club Sheffield Wednesday have sacked boss Jos Luhukay after just under a year in charge at Hillsborough. The 55-year-old Dutchman took over the Owls in January, winning only 16 and losing 19 of his 49 matches in charge. Coach Lee Bullen will take caretaker charge for Saturday's visit of Preston, with Wednesday 18th in the table, six points above the relegation zone. "I would like to place on record my thanks to Jos for the efforts he has given," chairman Dejphon Chansiri said. Was Luhukay hampered by off-field issues? The Owls have won just one of their past 10 games and owner Chansiri revealed at a fans' forum on Wednesday that he would listen to offers for the club. His announcement followed the club being placed under a transfer embargo between April and August of this year for breaching Financial Fair Play (FFP) rules. Under the English Football League's profitability and sustainability regulations, clubs are not allowed to post losses in excess of £39m over three years without punishment. The most recent available financial figures show the Owls lost more than £20m in 2016-17, an increase of £15m on the previous year. "The EFL changed the regulations at the end of last season. We didn't just break (FFP rules) a little, we broke them a lot - eight figures," Chansiri told the forum. "We have problems with FFP, so it is hard, but we will try our best."